John’s painful personal experience with burnout while in a Senior Leadership role, and his subsequent recovery, led him to start his own consulting business in 2010, with a clear focus to mentor high achievers (business owners and corporate executives) to a more holistic view of self-leadership. John has developed a practical, relevant methodology that enables high achievers to pursue audacious goals without neglecting all that is precious in their world. This process enables the integration of all the elements of life into a clear and workable plan that brings clarity and peace of mind. 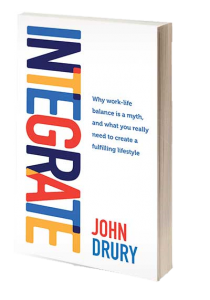 John Drury is a powerful Presenter, Trainer, Facilitator and Mentor. He splits his time between working with business leaders as an Executive Coach/Mentor, Facilitating Strategic Planning and Healthy Culture Processes for companies, and running Leadership and Team Training for a range of companies. John’s passion is to release the potential within people and teams, and to help high achievers to pursue their goals passionately without sabotaging all that is precious in their world. He strongly believes that it is possible to achieve extraordinary success AND build a great lifestyle as well. Included on this page is a 30 minute interview conducted by Know My Life Productions which gives some background to John’s life and why he is so passionate to work as a business mentor with high achievers so they achieve their goals AND build a great lifestyle. A podcast interview conducted with Phil Morgan from ‘The Positive Phil Show’, a leading podcaster based in San Diego, California. We discuss a range of things including why I am so passionate about working with high achievers as a business mentor to assist them to achieve massive goals AND build a great lifestyle. Listen to “Professional Mentor, Author and Consultant John Drury is On The Positive Phil Podcast” on Speaker. Contact John on 0405 539025 or john@johndrury.biz to discuss how he can help you.